Something we never did before. We partnered with the guys at The Impossible Society to create a new, unprecedented approach to escape rooms. 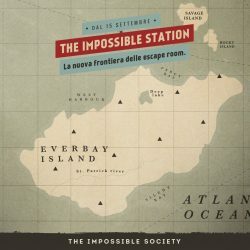 After months of research and experiments the result is The Impossible Station, an escape room in which new technology and old fashioned contraptions meet to create a unique experience. We cannot say more to not spoil the magic you’ll find in The Impossible Station. We can just add that it has been incredibly fun and challenging to participate in the creation of the story, the enigma and technology inside the room. Experience it by yourself if you are in Milan. All info on The Impossible Society web site.